Demonstration held in Rafah, in the southern Gaza Strip, to mark the 99th anniversary of the Balfour Declaration. 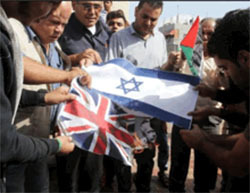 Demonstrators burned Israeli and British flags as well as pictures of Lord Balfour (Safa, November 2, 2016). 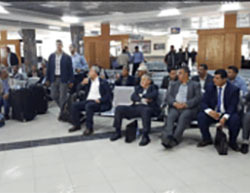 The Rafah crossing opens for the exit of the delegation of 120 Gazan businessmen (Facebook page of QudsN, November 6, 2016). The Ibn Taymiyyah Media Center report on the Hamas campaign to summon Salafist-jihadist operatives for interrogation (Twitter account of the Ibn Taymiyyah Media Center, November 6, 2016). 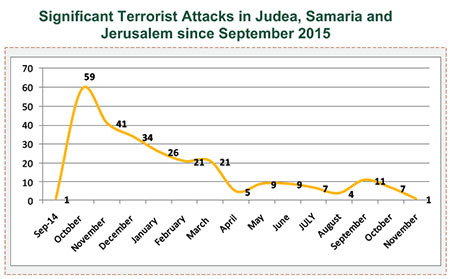 Popular terrorism attacks continue. This past week there was an attempted stabbing attack at a bus stop near Ofra, northeast of Ramallah. A bombing attack of an IDF post in Hebron was prevented by the Palestinian Authority (PA) security forces. Hamas and other terrorist organizations strongly criticized the PA security forces for preventing the attack. The 99th anniversary of the Balfour Declaration was exploited by Hamas and the PA for strong condemnation. Nabil Abu Rudeina, spokesman for Mahmoud Abbas' office, called the Declaration the "crime of the [20th] century" and called on Britain to rectify its "historic mistake." 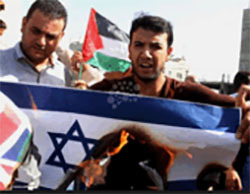 Hamas claimed the Declaration was the beginning of "abuse and injustice" towards the Palestinians and stressed its own adherence to the "right of return" of the Palestinian refugees [to their former homes] and to their refusal to recognize the State of Israel. November 3, 2016 – A Palestinian went to a bus stop near the community of Ofra (northeast of Ramallah) and tried to stab IDF soldiers guarding the site. The soldiers shot and killed him. The Palestinian media reported he was Ma'an Nasr al-Din Abu Qara, 23, from the village of Mazraa al-Gharbia, northwest of Ramallah (Twitter account of Paldf, November 3, 2016). Ma'an Abu Qara had two Facebook pages but they showed no recent activity. The last postings were on January 2, 2015 on one, and on September 25, 2015, on the other. Nothing was found on either that would indicate he was planning to carry out a terrorist attack. Left: The knife used in the attempted stabbing attack (al-Arab, November 3, 2016). Right: Ma'an Nasr al-Din Abu Qara (Twitter account of Paldf, November 3, 2016). On November 5, 2016, the PA security forces prevented an attack on an IDF force in Hebron. Palestinians attached an IED to a gas balloon weighing 12 kilograms (26.4 pounds) and placed it near an IDF post in Hebron. The post is located between the Jewish and Palestinian quarters of the city. The IED was placed on the Palestinian side of the barrier. A short time later the PA security forces detained the Palestinian who had planned the attack. He said he had planned to throw a Molotov cocktail at the Israeli soldiers manning the post, run away and detonate the IED as the soldiers chased him. The IED was detonated in a controlled explosion by the IDF. Left: Palestinians gather in the center of Hebron after the IED is detonated. 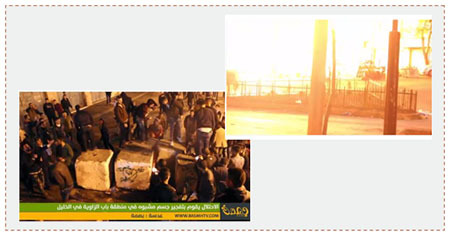 Right: The IED is detonated in a controlled explosion in the middle of Hebron (Facebook page of the Hebron Daily News, November 5, 2016). 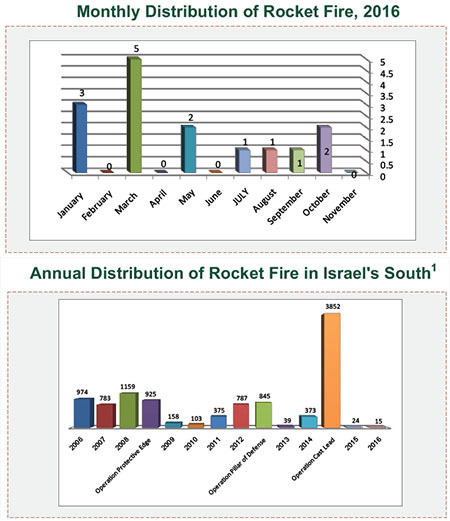 Hamas and other terrorist organizations were strongly critical of the PA security forces' actions. Husam Badran, a Hamas spokesman, claimed that preventing the attack and detaining the operatives was a dangerous step, and showed the damage inflicted by the PA security forces on the "resistance" (Hamas website, November 6, 2016). The Democratic Front for the Liberation of Palestine (DFLP) claimed preventing the attack was a "new crime" and proved the PA had become a shield protecting Israel (alresala.net, November 6, 2016). In the meantime, riots, the throwing of stones, Molotov cocktails and pipe bombs, and light arms fire continue in Judea, Samaria and Jerusalem. November 6, 2016 – The Jerusalem police detained a 36-year-old Palestinian woman from the Old City who said she was planning to carry out a terrorist attack. A search of her house revealed two knives lying next to a Qur'an. She was detained and taken for interrogation (Spokesman's unit of the Jerusalem police department, November 6, 2016). November 6, 2016 – Palestinians threw stones at an Israel bus near the community of Efrat (Gush Etzion). There were no casualties; the windshield of the bus was damaged (Facebook page of Red Alert, November 6, 2016). November 3, 2016 – Palestinians shot at an IDF force at the entrance to Tulkarm, wounding an IDF soldier. A search of the area revealed the site where the shots were fired, and a number of empty shells were found (Facebook page of Red Alert, November 3, 2016). November 3, 2016 – Palestinians carried out a drive-by shooting at the guard post of the IDF base in Ofra (northeast of Ramallah). There were no casualties (Facebook page of Red Alert, November 3, 2016). November 2, 2016 – Palestinians threw stones at a bus on the road between Gush Etzion and Hebron, near Bayt Ummar. The bus was damaged. 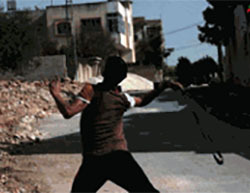 Palestinians threw stones at an Israeli vehicle near the Azzun Junction. There were no casualties. The vehicle was damaged (Facebook page of Red Alert, November 2, 2016). In recent months the Israeli police detained 21 Palestinians suspected of involvement in throwing stones, shooting fireworks and throwing IEDs at the site of the Tomb of Rachel in Bethlehem. Investigation revealed that in most cases they operated as organized squads, planning and coordinating attacks, acquiring fireworks and preparing the IEDs. They downloaded instructions for making IEDs from the Internet. They often met near the Tomb of Rachel, especially on Friday afternoons, approached the site, threw stones and IEDs, and fled (Spokesman's unit of the Jerusalem police department, November 7, 2016). The prosecutor of the southern district filed an indictment in the Beersheba district court against a fisherman from the Gaza Strip who was in contact with Hamas operatives and smuggled diving equipment from Egypt to the Gaza Strip. He also tried to smuggle two hundred weapons, for which he received $1,200 (Israeli news websites, November 6, 2016). 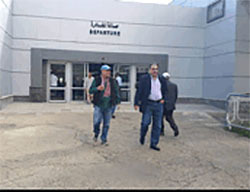 Hisham Adwan, director of the Palestinian side of the Rafah crossing, reported that on November 6, 2016, Egypt opened the crossing to allow 120 Gazan businessmen to attend a three-day economic conference in Egypt (al-Quds, November 6, 2016). Egypt will open the crossing again on November 10, 2016, to allow them to return to the Gaza Strip (Facebook page of QudsN, November 6, 2016). According to the Twitter account of the Salafist-affiliated Ibn Taymiyyah Media Center, Hamas' security forces have recently summoned many Salafist operatives from throughout the Gaza Strip to its interrogation centers. The summons are allegedly part of Hamas' campaign against the Salafist-jihadists in the Gaza Strip (Twitter account of the Ibn Taymiyyah Media Center, November 6, 2016). 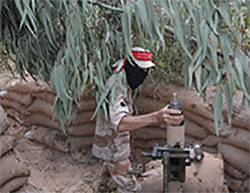 On November 5, 2016, operatives of the National Resistance Battalions, the DFLP's military-terrorist wing, held a military exercise to mark the end of a military training course for its operatives in Rafah. The operatives simulated firing a guided missile at an IDF post, firing mortar shells, storming the post and abducting an IDF soldier (Facebook page of the National Resistance Battalions, November 5, 2016). 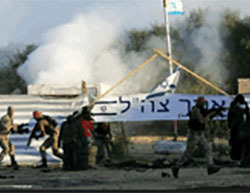 Simulations of attacking and taking control of IDF posts and abducting IDF soldiers have been recurrent themes in the training held by the Palestinian terrorist organizations since Operation Protective Edge. Hamas issued a formal statement claiming the Balfour Declaration was the beginning of "abuse and injustice" towards the Palestinian people and their holy sites. Hamas stressed its adherence to the "right of return" of the Palestinian refugees the homes they were expelled from in 1948 and to its absolute refusal to recognize the State of Israel or reach any agreement with it. The statement also stated that the way to liberate the Palestinian territories was national unity and to wage a joint struggle against Israel (Hamas website, November 2, 2016). Left: Khaled Mashaal interviewed by al-Jazeera for the anniversary of the Sikes-Picot Agreement and the Balfour Declaration (Hamas Twitter channel, November 2, 2016). Right: The formal statement issued by Hamas concerning the Balfour Declaration (Hamas website, November 2, 2016). 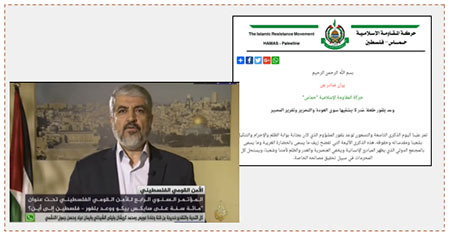 Khaled Mashaal, head of Hamas' political bureau, gave a speech on November 2, 2016, to mark the Sykes-Picot Agreement and the Balfour Declaration. He said that the "gamble" for a peace agreement had failed, and claimed the Palestinian Authority could not exist under an occupation. He called on Palestinians to "resist" the occupation [i.e., to employ violence and terrorism] because there was no other way to end it. He also called for a national partnership, the rehabilitation of national unity and the formulation of a joint strategy for the struggle against Israel (al-Jazeera, November 2, 2016). The PA is planning to file another formal request to join Interpol at the organization's annual conference, held this year on the island of Bali in Indonesia. In August 2015 the PA filed its first request to join but it was denied on the grounds that it had been filed too late. The PA renewed its request at the beginning of the year. However, in June 2016 the governing committee decided not to discuss the request but rather to appoint an independent committee of experts to determine criteria for the acceptance of new members. Israel opposes allowing the Palestinians to join Interpol. "Israeli political sources" noted that accepting the PA, which is not a country, will politicize the organization's decisions and give the PA access to international databases of terrorism and crime, demand the extradition of criminals. A Palestinian delegation, including representatives from the PA's ministries of foreign and the interior, went to Bali to participate in Interpol's annual conference (Quds.net, November 5, 2016). Omar Hajjadi, a senior figure in the PA's foreign ministry, said the ministry was planning to protest the delay in discussing the Palestinians' request for membership. He said the vote on the Palestinian request was not planned for Interpol's next meeting and that the Palestinian delegation would protest the way the organization was dealing with the Palestinian request (Filastin Online, November 4, 2016). On another occasion Omar Hajjadi said that a special commission had been appointed to examine the Palestinian request and that a vote would be held at the organization's next meeting (Voice of Palestine, November 3, 2016). 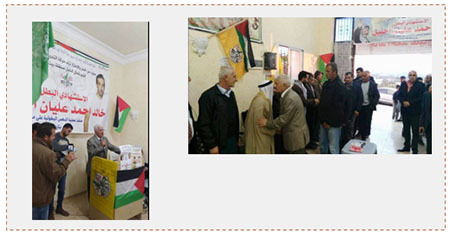 On November 4, 2016, Abbas Zaki, a member of Fatah's Central Committee, visited the mourning tent erected for Khaled Ahmed Alian Ikhlil in Bayt Ummar (north of Hebron). He even said a few words in his memory. Posters can be seen in pictures posted to the social networks, glorifying his memory (Facebook page of Abbas Zaki, November 4, 2016). 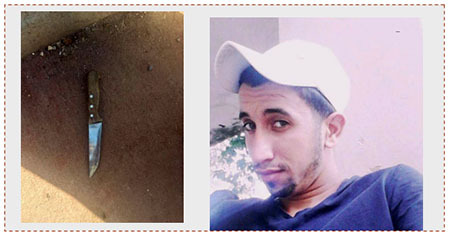 On October 30, 2016, Khaled Ikhlil carried out a vehicular attack near Bayt Ummar, wounding three Border Policemen. Abbas Zaki, a member of Fatah's Central Committee, pays a consolation call on the family of Palestinian terrorist Khaled Ikhlil in Bayt Ummar. The mourning posters were provided by Fatah in northern Hebron, and glorify the terrorist and his attack (Facebook page of Abbas Zaki, November 4, 2016). Fatah continues its campaign to boycott Israeli-made products by means of its websites. Its information commission's official website recently issued a notice calling for the boycott of Israeli-made products, claiming Israel used the profits to buy ammunition for use against Palestinians (Website of Fatah's information commission, November 7, 2016). Notice issued by Fatah's information commission calling for the boycott of Israeli-made products. 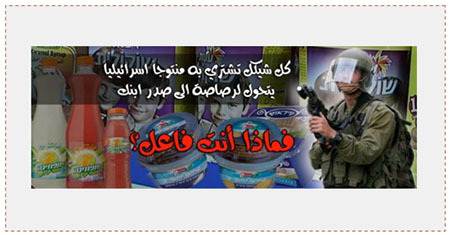 The Arabic reads, "Every shekel you spend to buy something made in Israel is a bullet in your son's chest. And what are you doing [about it]?" 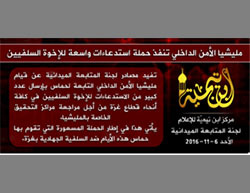 (Website of Fatah's information commission, November 7, 2016).